Brian Kemp, center, walks with President Donald Trump, right, and Sen. David Perdue (R-Ga) as Trump arrives for a rally in Macon. U.S. Sen. David Perdue told members of the Georgia House of Representatives that he expects a disaster relief package to help victims devastated by Hurricane Michael to be signed by the president this week. Aid promised to farmers in South Georgia was struck by federal inaction after being caught up in President Trump’s demands for increased border wall funding and the subsequent government shutdown. This stalled federal dollars from making their way to those who needed aid following the storm that struck parts of Florida and Georgia in October 2018. Earlier this month, Gov. 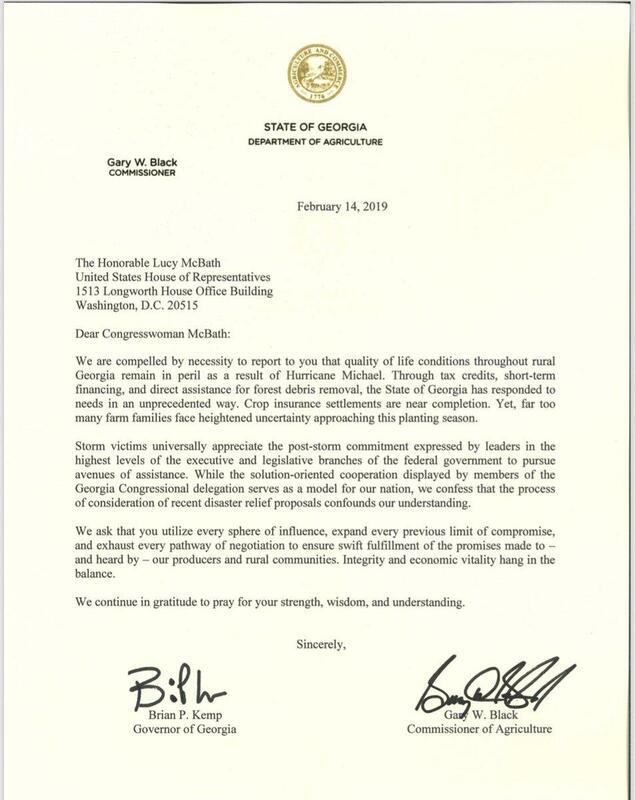 Kemp and Agriculture Commissioner Gary Black sent a letter to members of Georgia’s congressional delegation demanding action from the federal government. Letter sent by Gov. Brian Kemp and Agriculture Commissioner Gary Black to each member of Georgia's Congressional Delegation. “We ask that you utilize every sphere of influence, expand every previous limit of compromise, and exhaust every pathway of negotiation to ensure swift fulfillment of the promises made to — and heard by — our producers and rural communities,” Kemp and Black stated in the letter. Following the message from Kemp and Black, Sens. Johnny Isakson and David Perdue introduced a disaster relief package to aid Georgia and other states impacted by hurricanes and wildfires. Immediate relief for cleanup and urgent recovery efforts was provided by the Federal Emergency Management Agency and boosted by a $270 appropriation passed by the General Assembly during a special legislative session in November 2018. The funds requested in this bill are aimed at supporting the local governments hardest hit by the hurricane as they rebuild their agriculture industries, strengthen infrastructure and help their economies recover from the damage.